Sweetgum leaves. 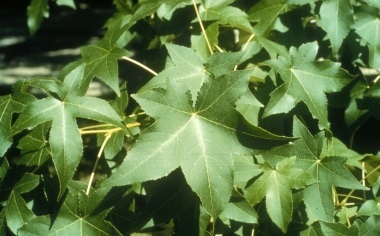 The dynamics of oak-sweetgum stands are studied on the Delta. Photo by Robert Webb, courtesy of bugwood.org. Located in Washington County, Mississippi, the 2,600-acre Delta Experimental Forest (the Delta) was established in 1945 by the U.S. Forest Service and is owned and managed by Mississippi State University (MSU). The Forest Service Southern Research Station (SRS) Center for Bottomland Hardwoods Research conducts research on the forest under a long-term cooperative agreement. Until the 1970s, the Delta was a working forest with a crew of technicians to establish and maintain research studies conducted by SRS scientists. Timber receipts paid for roads and facilities maintenance on the forest. Research during the first 30 years involved thinning studies, developing methods for growing quality southern hardwoods, evaluating results of efforts to improve eastern cottonwood clones, and studying the progression of heartrot diseases and the life cycles and impacts of insect borers. Later studies included determining the causes of oak decline and investigating red oak-sweetgum stand dynamics. These studies provided much of what is now known about growing different tree species in the poorly drained but fertile soils deposited by the Mississippi River. In addition, several eastern cottonwood clones selected during the 1960s and 1970s by SRS geneticists and tested in the Delta are still used by forest industry throughout the South and in Europe, Asia, and South America. The 1970s brought changes in state priorities that resulted in a decline in both forest operations and new studies on the experimental forest. By the mid-1990s, heartrot had degraded many of the older trees on the site; a devastating ice storm in 1994 damaged the crowns of most canopy trees. Most of the forest on the Delta was cut in the late 1990s to regenerate degraded forest stands. Oak seedlings were planted to supplement natural oak regeneration. Over the last two decades, the Delta became home for a new round of experiments that combine the expertise of SRS scientists in the bottomland hardwoods unit on subjects ranging from red oak-sweetgum stand dynamics to the ecology of wood-destroying insects. For more information, email Ted Leininger at tleininger@fs.fed.us.